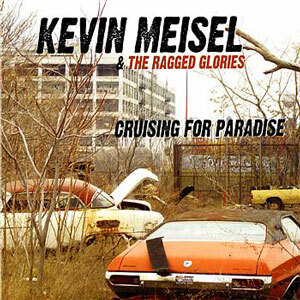 The idea and momentum for Cruising for Paradise, Kevin Meisel’s third record, (his second for the Brambus label), germinated while Meisel and guitarist Alex Anest were touring Switzerland in 2004. At that time, while touring behind Meisel’s folk/country inspired recording Country Lines (Brambus, 2003), the two musicians listened incessantly and repetitively to Beatle recordings, most notably Revolver, and The White Album. Interspersed between those listenings were other familiar favorites by Dylan, Merle Haggard, Johnny Cash and Neil Young, all artists hugely influential on Meisel. During trips between the venues, the two engaged in spirited dialogues about those records and what made them so timeless and lasting. Inspired, Meisel, who is mostly known for his folk narrative songwriting style, began to include in his live sets various selections from an unrecorded cache of songs in his catalogue. Those tunes, written in a more pop style than is customary for Meisel, brought an unusual variance to the live shows and sets. In Alpine hotel rooms, in sound checks before shows from Lucerne to Filisur and Chur, the two rehearsed the tunes and other favorite covers, later interspersing them in the live shows to positive audience response. So, while touring in 2005, Anest, emboldened by the prior tour’s experiments, proposed that the tunes they were now playing more regularly in the shows be recorded for Meisel’s next release. Initially hesitant, Meisel eventually warmed to the idea, and accepted Anest’s proposal to both record and produce the new record. The resulting release is Cruising for Paradise, an eclectic blend of song styles that embrace both Meisel and Anest’s love of classic, Beatlesque pop; rootsy Americana flavored Rock and Roll, and folk narrative song styles. The tracks, largely cut live on vintage recording gear in a rundown recording studio in Detroit, feature a celebration of the tradition of the rock aesthetic of feeling as content itself. In this sense, Cruising for Paradise is a change of direction for Meisel. The record features what Meisel describes as his dream touring band . Meisel has affectionately named his band, The Ragged Glories . Band members include, Alex Anest and Sam Vail on electric guitars, Keith Meisel on bass; Jim Latini on drums, with Kevin handling acoustic guitar and keyboard duties. The recording, produced by Anest, serves to bring forward the rootsy, pop song style influences lurking in Meisel’s approach to songwriting all along. Cruising for Paradise then, serves as a double entendre: On this new recording, Meisels’s song characters continue down the boulevard of life, cruising for an ephemeral and fleeting sense of what is real and lasting, even as Meisel and his band cruise for the paradise found in making music exuberant and real.